A former six-storey hotel has been destroyed by a fire that spread to three properties in a Devon town. Twenty fire crews from around the county were called to help with the fire at the derelict Montebello Hotel in Ilfracombe on Wednesday night. No one was injured in the fire but surrounding properties were evacuated and one resident forced to stay in emergency council accommodation. The A399 in Ilfracombe and Fore Street remained closed on Thursday. 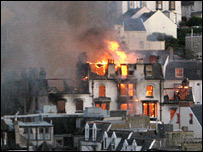 Fire crews were called to blaze shortly before 1900 BST, with 20 fire engines in attendance. Reinforcements from Somerset were also drafted in. Some residents were taken to a nearby church, with one housed overnight by North Devon District Council's Emergency Housing Department. A fire brigade spokesman said the crews were continuing to damp down on Thursday morning at the building. Fore Street will remain closed until the fire is completely extinguished and structural engineers have examined the premises. Inquiries are continuing into the cause of the fire.